The inaugural Rolls-Royce Data Innovation Challenge - Asia concluded on 1 March 2019 as nine shortlisted teams delivered their final pitch at the Rolls-Royce Seletar Campus in Singapore. The first of its kind in Asia, the Challenge attracted 58 submissions from teams across Singapore, Hong Kong, China and India. These teams included startups, community teams, and even one internal team - Zero Build Stop. Zero Build Stop was the only team comprising three full-time Rolls-Royce China employees. They were subsequently one of nine shortlisted teams to pitch to industry leaders. We spoke with Bao Yu, Rolls-Royce Program Management Graduate and team leader of Zero Build Stop, to learn more about her experience. When news of the Rolls-Royce Data Innovation Challenge - Asia was posted on internal communications platform Yammer, Bao Yu jumped at the rare opportunity to participate, inviting two other full-time colleagues. Her genuine interest in optimising flight schedules and expertise in data analysis drove her to tackle the aviation challenge from an independent viewpoint apart from her day job. team work to develop the solution? Every week, our team would have an hour-long discussion on how we wished to proceed with the competition, and talked about the ideas and functions we wanted to include in our demo. Most of the tasks were done outside work hours or during the weekends. There were two stages to our process. We first used Python to analyse the data for predictions and then used Tableau to present results on a dashboard. The second part took most of our time. of the challenges that your team faced? We jumped straight into developing our solution hoping that airports would find our dashboard useful. It wasn’t until the later stages of the competition when our Pitch Clinic mentor, John, coached us and pointed out that we should’ve defined our key users. In the early stages, we also spent a huge amount of time digging for data and ensuring that the information we obtained was valid. Gennie, our mentor from Rolls-Royce Singapore, was very helpful and a great support. We had bi-weekly discussions with her and she proposed the use of more datasets for the competition. She also prompted us to think about the kind of information we should provide that would be useful to our target users. From there, we came up with search functions and more visualisation maps. In our everyday job, we don’t get many opportunities to communicate with players outside of the Engine Supply Chain. Meeting these other startups and community teams was very inspiring because we were able to meet talented people in the aviation and data analytics industry. We were also better able to see the bigger picture and understand how their solutions will help airports and airlines in the future. We were glad to learn from their innovative ideas and analytical structures as well. This Challenge allowed us to use our skills to address problems using new methodologies, and also learn about other approaches taken by other teams. Data Innovation Challenge - Asia? Upon our return to Rolls-Royce China, my team shared our experience during the Internal Department Review and through the official WeChat account. The overall feedback was very positive and I look forward to sharing my experience with the employees from different regions of China in the next month. This was perhaps the first opportunity for a team from Rolls-Royce China to participate in a challenge like this. Now that we’ve completed the journey and shared our experience, it seems like our colleagues, especially the young ones, are excited about similar opportunities. I’d like to encourage my colleagues to keep an eye on internal and external communication channels because that’s how you find out about such exciting events! Participating teams may benefit from communicating early and often with the hosts. Time management is important throughout the challenge process, so don’t hesitate to reach out. You’d want to be able to make changes to your solution earlier, rather than later. 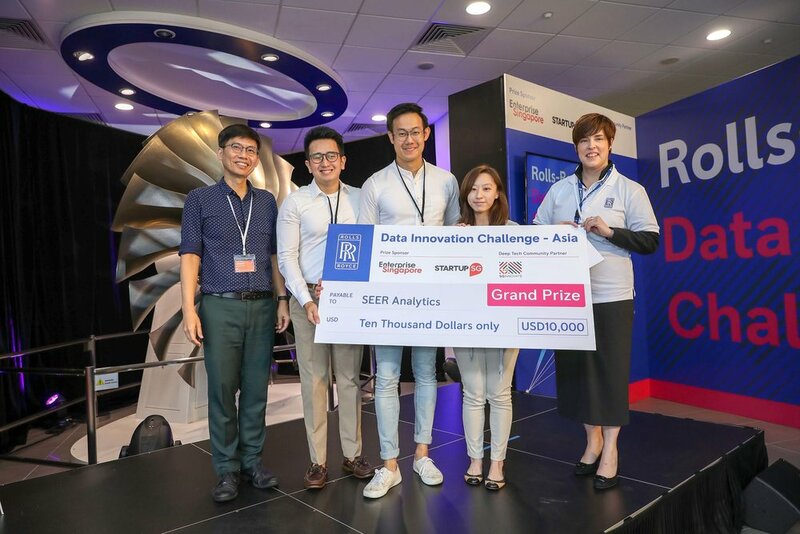 SEER Analytics won the Grand Prize for the Rolls-Royce Data Innovation Challenge - Asia last Friday with their proposed machine learning-powered API solution that allows the different aviation industry players to contribute and benefit from shared data, in order to achieve more accurate flight predictions and planning. The Singaporean startup bagged both the SGD50,000 grant (part of the Startup SG Award from Enterprise Singapore) and the USD10,000 cash prize from Rolls-Royce. The prize also included an invitation to join the qualifying round at the SLINGSHOT competition to be held in Singapore this coming November. “We are grateful for this enriching opportunity provided by R² Data Labs (Rolls-Royce’s acceleration hub for data innovation) that brought many diverse start-ups together to create solutions for industry challenges. The valuable communication and exchange of ideas with the Lab throughout the developmental process was informative and pivotal to our winning solution,” said Goh Keechin, co-founder of SEER Analytics. The Challenge, which marks the first of its kind in Asia, saw nine shortlisted teams from countries such as Hong Kong and India pitch to industry leaders on a regional stage at Rolls-Royce’s Seletar Campus in Singapore. The participants were comprised not only of startups, but also of community teams who were looking at aviation challenges from a fresh perspective. An example is one of two runner-ups, Coffeeshop Teens. Four data scientists who hold corporate day jobs put together a team for the Challenge, and their love for creative thinking eventually led them to prototype a flight-planning tool that can understand and predict the different components of flight delays based on an aircraft’s journey. ZestIoT Technologies, an Indian startup, also earned the position of runner-up with its platform that combines IoT and AI to assist airport operators improve on-time performance. Both teams received a USD2,000 cash prize. We proudly present to you the teams that are heading towards our finale stage at Singapore after a challenging evaluation process by the panel from R² Data Labs. Congratulations to all the shortlisted teams! We would like to also say a big thank you to everyone who has submitted their applications over the past weeks. Coffeeshop Teens (Singapore, Flight Scheduling) is a team of data scientists with masters degrees in Statistics/Computing and aerospace experience (DSTA, SIA), driven to use their domain knowledge to create an innovative solution. Drootoo (Singapore, Engine Maintenance) provides a unified cloud platform for major hyper-scale cloud services and enabling of distributed cloud computing. ENGRAV (India, New Use Case) provides a fully-integrated, cloud based enterprise resource planning software that enables aviation businesses to manage the day-to-day and long-term technical, flying & operational needs. Innovative Binaries (Singapore, Engine Maintenance) offers a AI platform to assist operators with aircraft compliance and health management. Navigem (Singapore, Flight Scheduling) is a Big Data and analytics company that specializes in data-driven decision support solutions across domains through disruptive data engagement activities. OCTAD (Hong Kong, Flight Scheduling) - Optimization & Computation for Transportation and Aircraft Design Laboratory is one of the laboratories in Hong Kong University of Science and Technology under the Mechanical and Aerospace Engineering department. The members are experienced in multi-disciplinary design and optimisation on aircraft and air transportation. SEER Analytics (Singapore, Decision Support) is founded by developers and engineers who are passionate about the future of operational data and geospatial analysis. ZestIoT (India, Flight Scheduling) provides an IoT- & AI-enabled aviation platform to integrate passenger, baggage, aircraft, ground, and airport operations to deliver improved on-time performance, and help airports deliver 10% more throughout without change in inventory. Zero Build Stop* (China, Flight Scheduling) is a team comprising of Rolls-Royce civil aerospace employees based in Xi'an, China working on Rolls-Royce’s supply chain to deliver parts to support various engines including Trent 7000/1000/XWB.